“Tapping Love,” a poem by Alfred McVetty, Guildhall, Vermont. My friends Alfred and Susan McVetty live up in the hills of Guildhall, off the grid. Here is a poem that Alfred wrote recently. It is reprinted here with his permission. 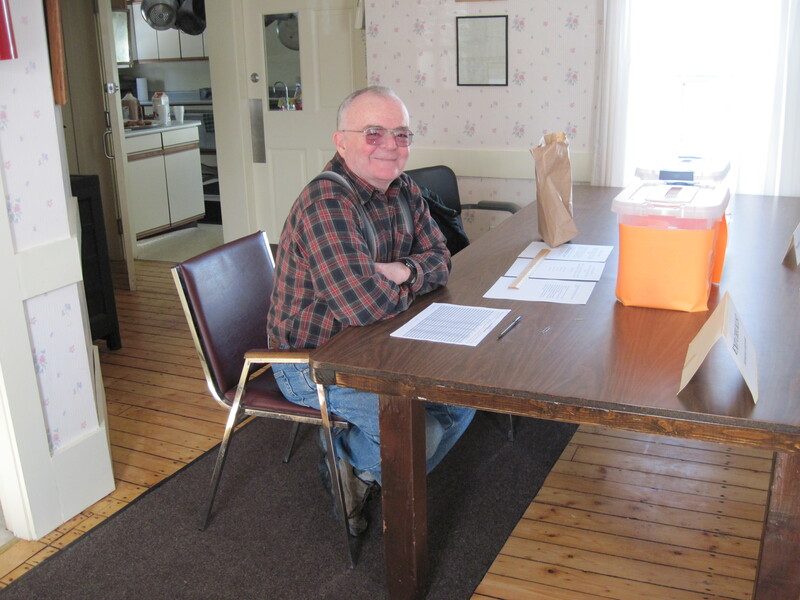 Alfred McVetty, staffing the election polls in Guildhall. Every spring, Alfred and Susan, along with various family members and friends, tap the maple trees on their property on Stone Mountain. 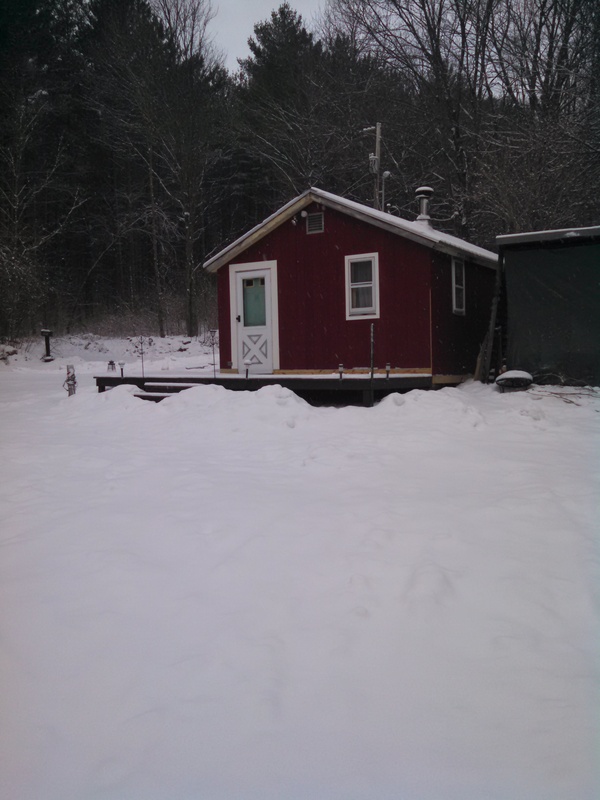 (Maple sugaring is just one of the McVettys’ many skills and endeavors). When I asked what inspired the poem, he told me that this year, in anticipation of maple sugaring time, he and Susan had made a big change. They decided to replace all their maple sugaring spiles (also known as spouts). They’ve been using 7/16″ metal spiles until now. But the new ones they’ve purchased are all plastic and 5/16″. Alfred got to thinking about the trees on his property and how the 7/16″ spiles can do a lot of damage to trees. Damage is even more likely if you’ve got lots of family and friends helping with the taps, because not all of those helpers will necessarily have the skills to drive the 7/16″ spiles into the tree properly and gently. He told me how the new 5/16″ spiles, when driven in, will make a tap, tap, tap, and then a thunk. The thunk is a reliable indication that you’ve driven the spile in just far enough, and no more. 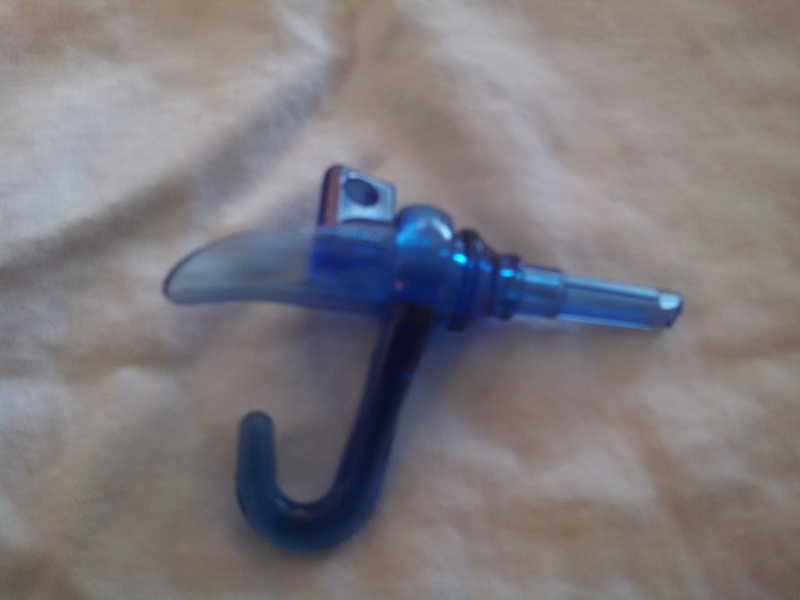 Maple Sugar Spile with hook from LaPierre’s, of Vermont. He bought all new spiles because he wants to be gentler on the trees–in short, to be a good steward of the forest. And that is what moved him to write the poem. I love Alfred. I love how in his world, practical matters intersect so gracefully with poetry. We’ve been waiting, on the edge of our seats for months. 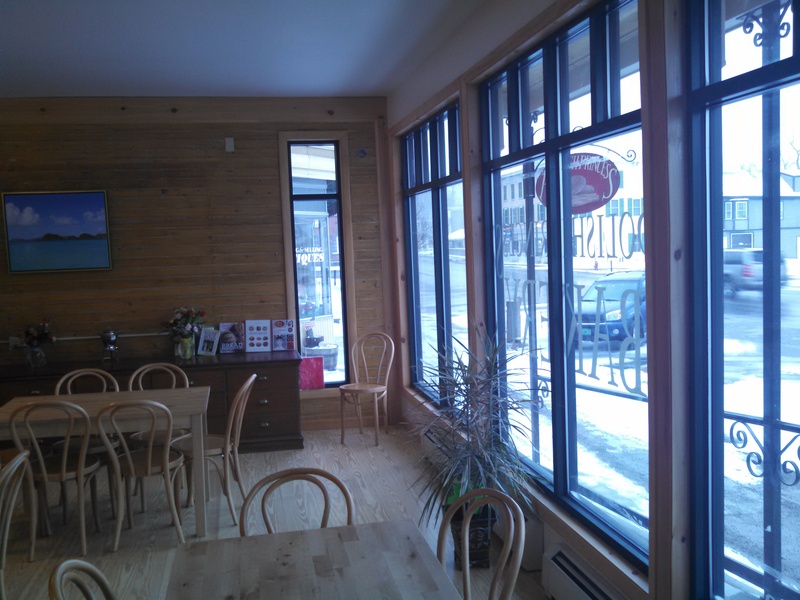 Finally, this weekend, we have a new bakery and coffee shop, in downtown Lancaster, NH, a ten minute drive from where I live in Guildhall, Vermont. 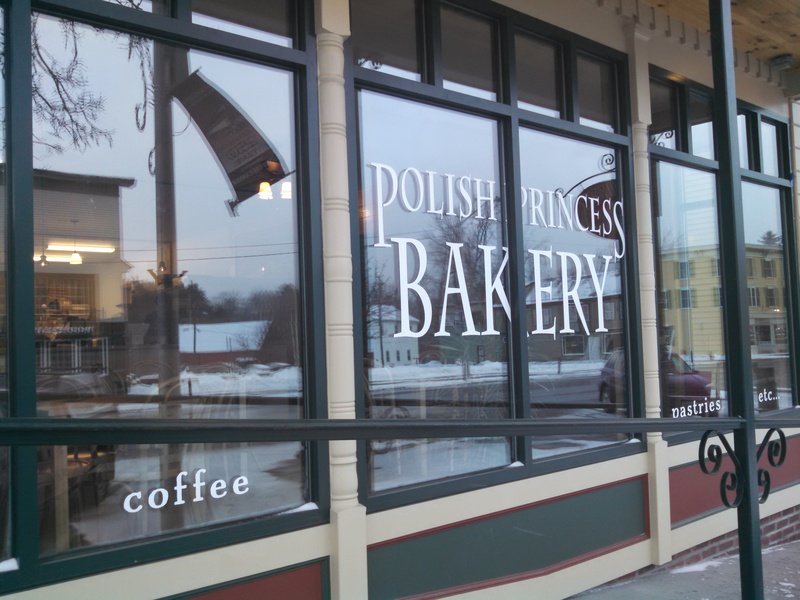 Magdalena Randall, who has garnered a beloved following for her baked goods and bread sold at the Lancaster Farmer’s Market, has taken the leap and opened a beautiful new coffee shop and bakery on Main St, known as the Polish Princess Bakery. I paid a visit early this morning and came away with a supply of currant scones, two chocolate tartlets, and a double cappuccino. The cafe is warm, cozy, inviting and spacious, with hard wood floors, fresh flowers, baking books on display and a friendly and open kitchen/baking area. The food–as expected–is mouthwatering and the atmosphere delightful. I snapped some photos inside and out and chatted with owner Magdalena Randall, who reported that she did a brisk business yesterday, at breakfast and lunchtime. It’s a great place and something we’ve sorely needed for many years here in the Essex County and Northern Coos County region. 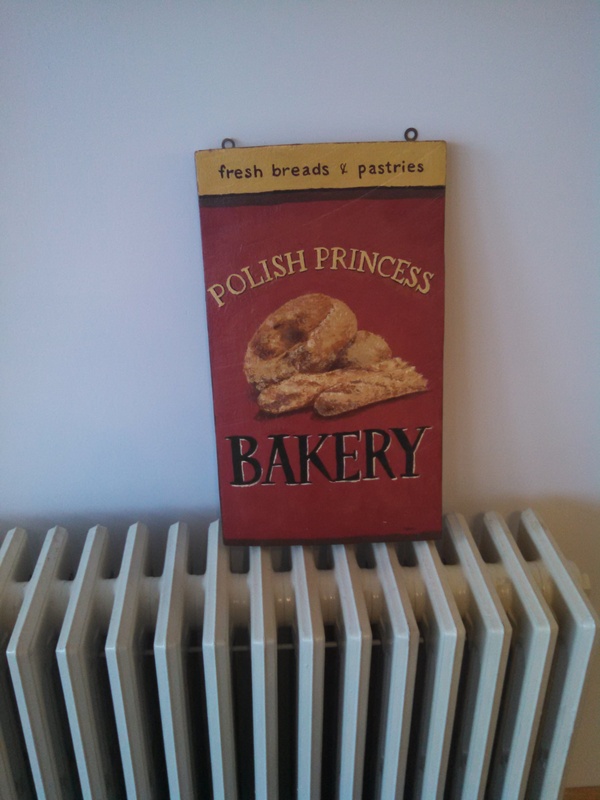 Here’s a link to the Polish Princess Bakery facebook page for more information. 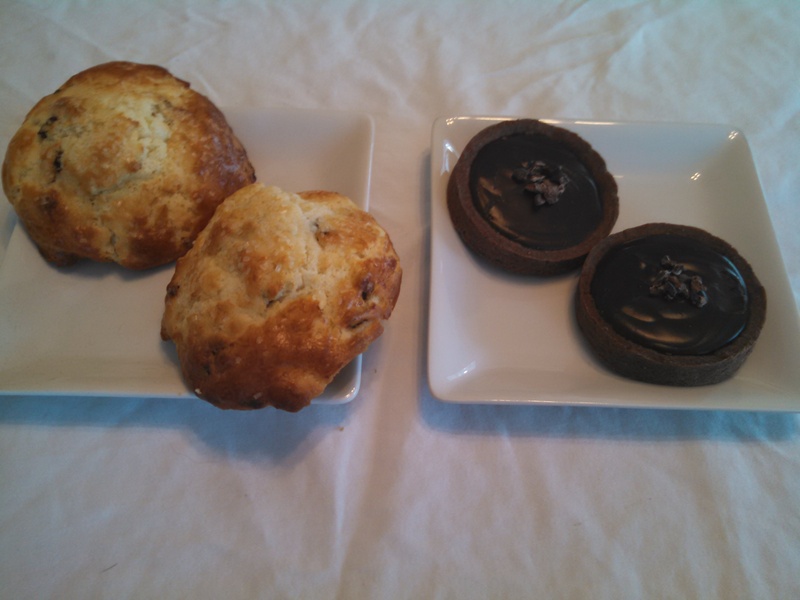 Here’s a sampling of the delicious baked goods I brought home this morning from there. Oh, don’t worry. 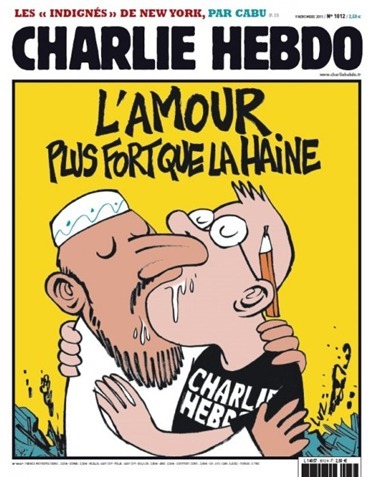 I have no illusions that my little blog with its miniscule readership can be compared to Charlie Hebdo, the spunky magazine that bravely continued to publish its clever and incisive satire even after it was bombed, threatened and hacked. Nor am I under any grandiose belief that my blog is somehow equivalent to august and respectable paragons of journalism and free expression such as the New York Times, who–not so courageously–decided yesterday to refrain from publishing the Charlie Hebdo cartoons. I am not a famed, accomplished, or high profile blogger. But I still think it’s important to make this act of publication, living as we seem to, in a world where artists and writers can get murdered for what they do. Up In the Hills of Essex County: House or Camp? 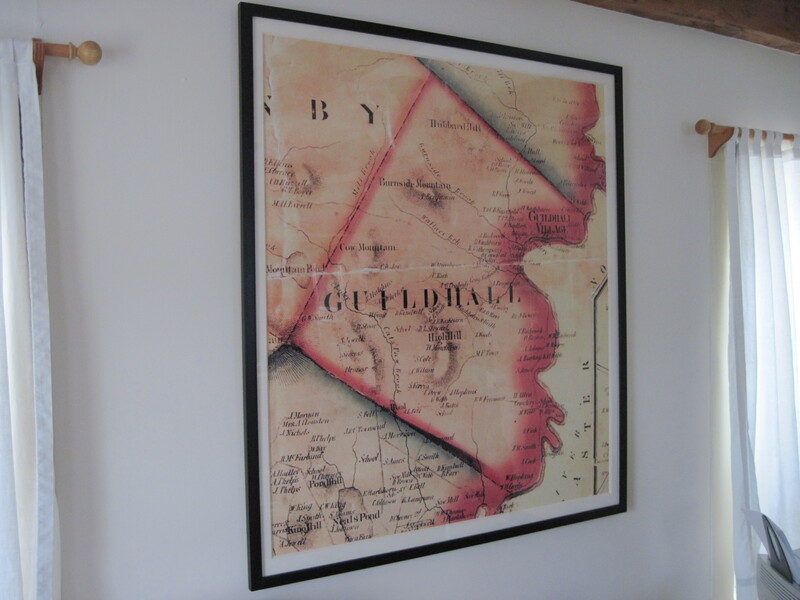 For about fifteen years now, Edward and his son Connolly have owned a house in the remote hills of Essex County. They bought it from Edward’s old friends Tim and Leslie Nulty. The house had been owned by Tim’s family since the late 1950s. His father however, had been coming to the “neighborhood” for much longer, since the 1930s when he worked summers as a counselor at the Boys Camp down the road. The house is over 200 years old and sits far back from the road. This time of year, you can just barely see it as you pass by, but in spring, summer and fall, it’s completely obscured by trees and foliage. Second, and more concretely, most “camps” don’t have indoor plumbing, electricity, gas stoves, furnaces, basements, telephones and aren’t multi-storied. 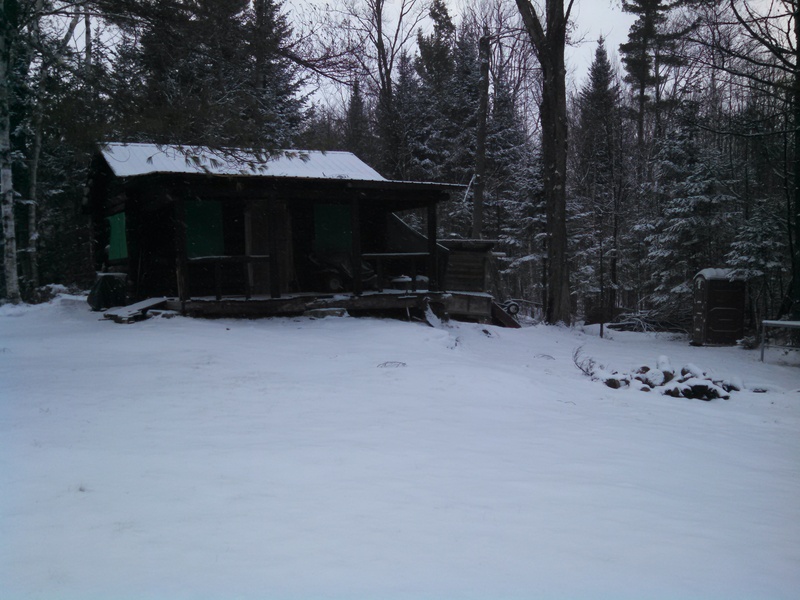 Our house in the hills may be a bit on the rustic side and it’s certainly remote, but there’s electricity, a gas stove/oven, an oil-burning furnace in the basement, (in addition to two woodstoves), running water that supports a toilet, bathroom, kitchen sinks and shower/bathtub. For years, we had a landline telephone here, until we abandoned it last year due to the fact that cell phone signals up here are now perfectly adequate. Plus, it’s a two storied house, with four rooms downstairs and three bedrooms upstairs. Our remote house in the hills is pictured atop this blog post. Today, I also went for a long walk and snapped photos of two other buildings in our vicinity, which to me, epitomize what a camp is. Note that in one of them, you can see the outhouse off to the side. What do you think? Is ours a house or camp? The overriding theme of 2014 is that Edward and I have now lived in Essex County, Vermont for a decade. Yes, believe it or not, ten years ago in the spring of 2004, we arrived in Guildhall from Boston with three dogs, a piano, and about 90 boxes of books in tow. We took up residence at the Benton Cottage, a Colonial Revival style home on the banks of the Connecticut River. We called it paradise. We didn’t know exactly how this new chapter in our lives would unfold, and we weren’t always sure that moving here had been the right decision. But it has been a great adventure, and I have come to consider Vermont my home. There have been interesting and dramatic twists and turns along the way, involving the legendary Mt Washington Hotel in Bretton Woods, municipal politics, serving as an Act 250 Commissioner for the NEK, and my decision to embark upon the Vermont Law Office Study program. After four years of study and apprenticeship, I took the bar exam in 2011 and was admitted to practice law. I’m now a proud criminal defense attorney and I also practice municipal, family, labor and landlord-tenant law. When we got up here, Edward was already officially retired from his full time and high powered job as an international vice-president of a major labor union. But to my amazement, never for a moment did he seem to experience any retirement regret. He runs an art gallery out of the house and is active in local and state wide (Democratic) politics. He served on the town selectboard and the cemetery and planning commissions. He’s our local Tree Warden. He’s Vice-Chair of the statewide Vermont Arts Council, administrative law judge for the Vermont Labor Relations Board, and current Treasurer of the Robert Frost Place in Franconia. We’ve climbed about 65% of the 4.000 footers in New Hampshire’s White Mountains (most of which are within an hour’s drive or less). We campaigned our hearts out for Barack Obama and Governor Peter Shumlin. I ran and finished four half marathons and several other smaller races. I entered five pies into local agricultural fairs. The three beloved dogs who moved from Boston to Guildhall with us have passed on (Mouchette in 2008, Simone in 2011, and Minerva in 2012), but we have three beautiful new dogs, Django, LaBelle and Hugo. And what was notable about this year? 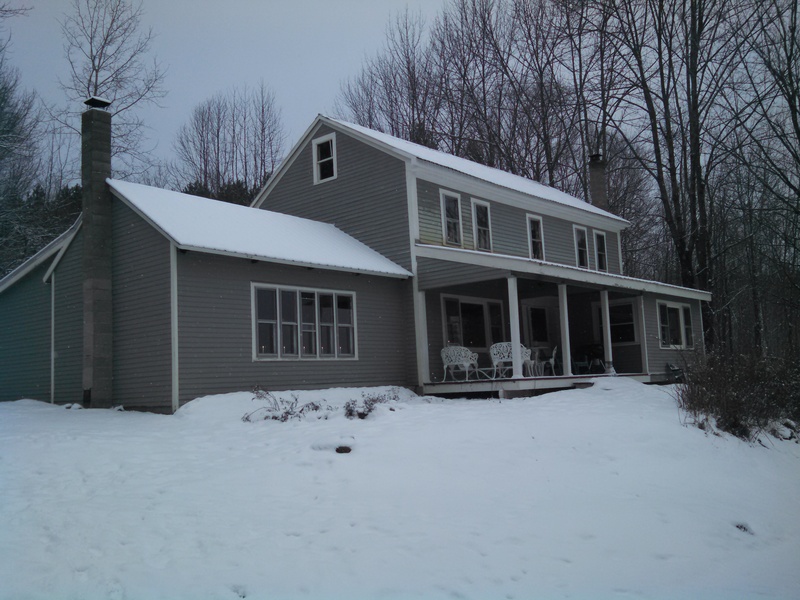 In January, I became a partner at Morrissette, Young & Wilson, in Lyndonville. In March, Edward and I traveled to the coast of Oregon, where we spent a week with my family at an idyllic location on the beach. In June, we spent a week in Seattle, my first time there. In September, my Guildhall friend Teri and I made a pilgrimage out to Burlington to hear live music on the shores of Lake Champlain, including the great band Lake Street Dive. Finally, this December 30 was the 20th year anniversary of the shooting death of my co-worker Shannon Lowney, at Planned Parenthood in Boston. My co-workers and friends at PP gathered together for the day, as we have many times over the last two decades. We have all scattered far and wide, but once we are together, it’s as if we were never parted. I am grateful to this group of women who love and look after one another, from near and afar.